Hubby has always been fond of Indo-Chinese food and I absolutely detest it! Yeah that's why they say: "opposites attract". 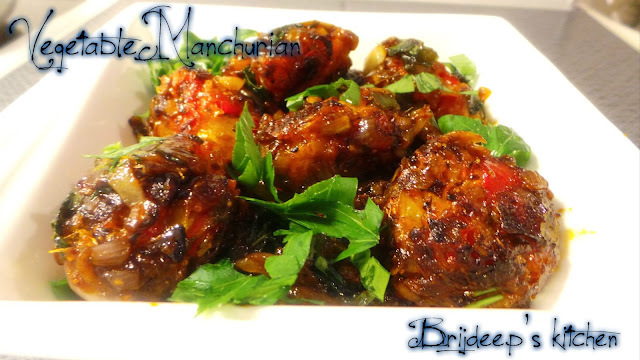 I told him I was going to prepare Vegetable Manchurian for him for his birthday and he got really excited. Then I went to shop for groceries for the Manchurian and I saw his eyes lighten up when he saw the cabbage and bell pepper and carrots. But I procrastinated preparing for a whole week and he kept asking me whatever happened to the Manchurian I was preparing. 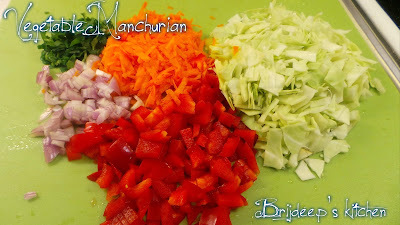 Finally on the day before his birthday, he told me just prepare the damn Manchurian today!! I have been dreaming for it since so long and I have no idea if you are even going to prepare it! I couldn't procrastinate more as it was his birthday and finally prepared these delicacies. 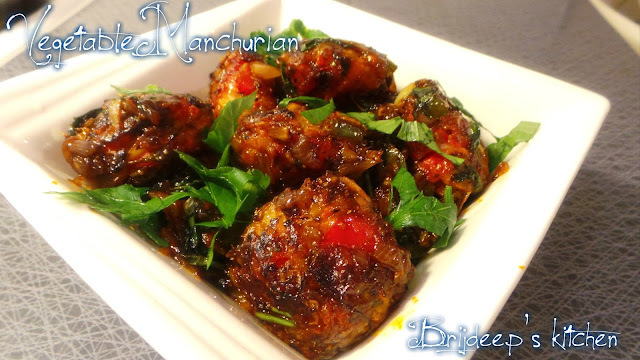 This is a dry version of Manchurian to be had as a snacks and trust me, ME who HATES Indo-Chinese also liked this light, simplified and flavorful version of Manchurian. I made this recipe in my Appe Pan. Do try this recipe and I'm sure you will love it! Recipe is inspired from www.vegrecipesofindia.com and I made my own modifications. All purpose flour: 2 tsp. First to prepare Manchurian balls. 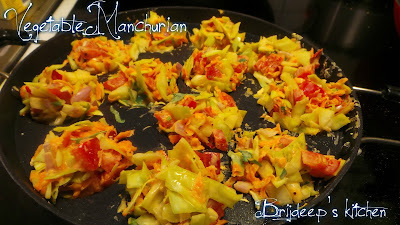 Take finely chopped vegetables. Mix together in a big bowl with salt, pepper, corn flour and all purpose flour. Do not add water, the water in the vegetables will be enough to bind them. Now make balls from all the mixture and keep aside. If you can't make balls then also don't worry as appe pan will help for in the balls. Heat the appe pan on medium-low heat and after 5 minutes add a drop of oil in each cavity. Add the prepared balls to the app pan. If you could not bind nicely to prepare balls, just add the mix to each cavity as it is. Cover for 10 minutes. 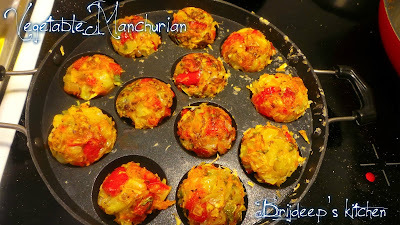 Well that sure looks funny.. haha I could not make balls so just added the vegetable mix. After 10 minutes, remove cover and carefully turn the balls to other side. If you could not make balls, then carefully check with a spatula if the bottom is cooked and ready to be turned. If it's cooked, the slowly turn all the balls to other side. Surprise! 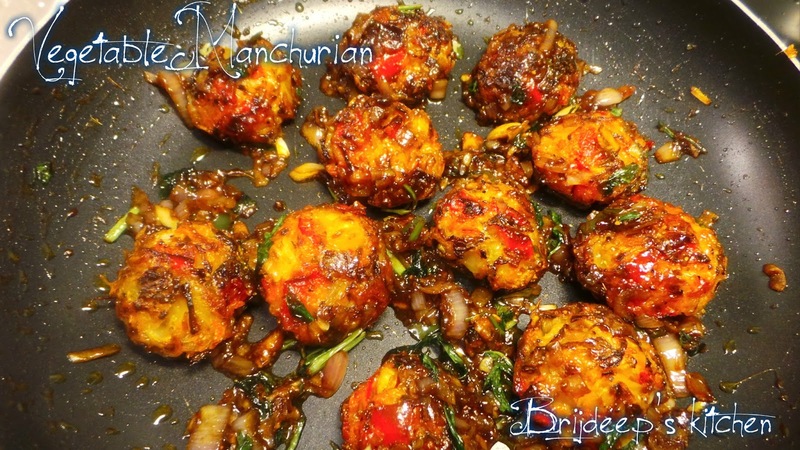 You now have perfect rounded Manchurian balls.. Appe pan magic! Cover and let cook for another 10 minutes. 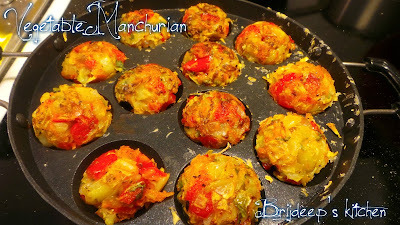 Remove cover and the Manchurian balls will be ready. Now we prepare the sauce. 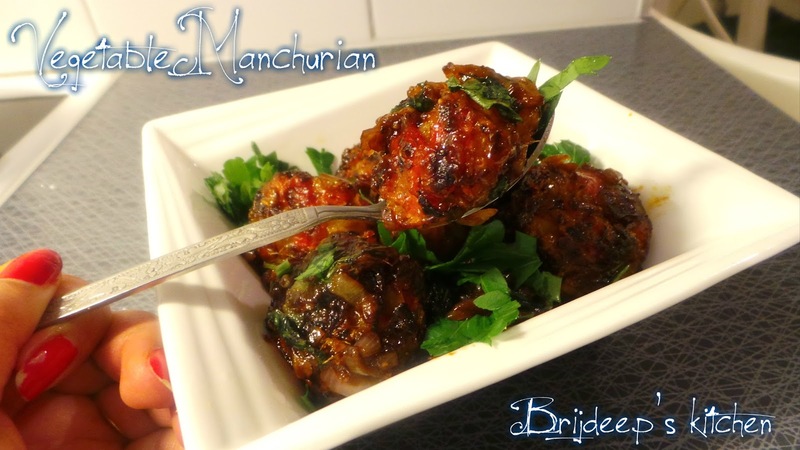 As it is dry Manchurian to be had as snacks, so little sauce is enough for the Manchurian balls to coat them with flavor. Heat oil and add the onion and fry. Add the ginger and garlic and let cook for about a minute. Add the soya sauce and the tomato ketchup. Mix well and add the salt and black pepper powder. 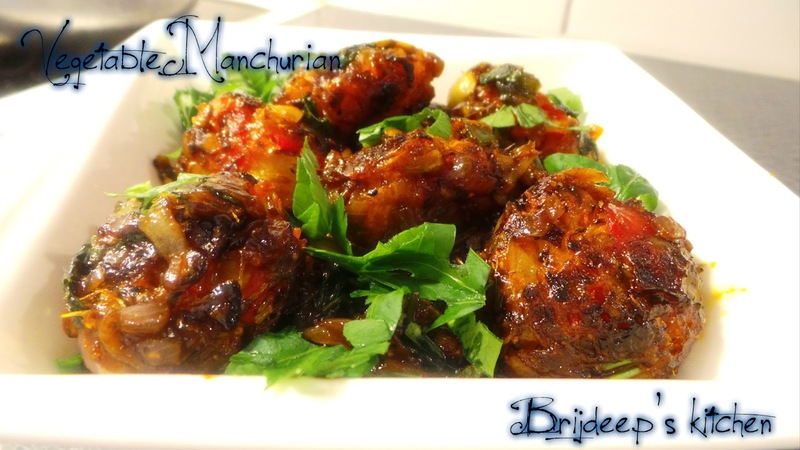 Now add all the prepared Manchurian balls to this sauce. 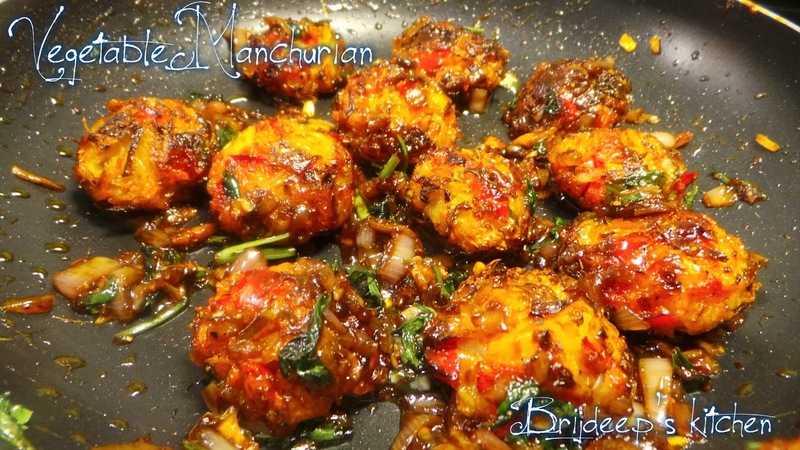 Stir the sauce slowly so as to coat the Manchurian balls evenly. Turn off the flame and add the vinegar. Garnish with spring onions and serve hot!